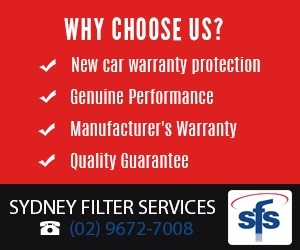 This filter will not void your vehicle's warranty. It is manufactured to meet the performance requirements appropriate to the application and is covered by the manufacturer's warranty when fitted by a licensed mechanic. Our suppliers have attained international certifications including ISO 9001:2000, ISO/TS 16949:2002. New Car Warranty: Under the Trade Practices Act, dealers cannot limit their warranty obligations or claim the warranty is void if the vehicle is appropriately serviced by someone other than the dealer or its agent. This applies to new and second hand vehicles (except those sold at auction). The consumer needs to ensure that the selected service centre employs qualified staff, the servicing complies with manufacturer’s specifications and uses genuine or appropriate quality goods.